Health practitioners encourage cycling as a measure to get fit. But cyclists are rightly concerned about the risk of being involved in a Boston bicycle accident. Our Boston personal injury lawyers are often called to represent victims who sustain serious injuries as the result of an accident with a careless or negligent driver. Bloomberg Businessweek HealthDay News recently published the result of a study that found cycle-only paths separated from street traffic are safer than paths riding alongside passenger vehicles in the streets. It was reported that injury rates are 28% less when cyclists are separated from having to ride next to motor vehicles. The design of intersections and green or red bicycle signals also directly impact cycling safety. The U.S. Department of Transportation recently reported over 600 deaths in fatal bicycle accidents nationwide in 2009, which accounted for 2% of all traffic fatalities during the year. Another 51,000 cyclists sustained injuries on American roadways in 2009 when involved in a motor vehicle crash. Massachusetts reported a total of 6 fatal bicycle accidents for 2009. The Unites States is a little behind the times when it comes to cycling safety. American bike lanes are typically designated on roadways by a painted stripe. The Netherlands has approximately 18,000 miles of separate bike tracks. The lack of bike tracks encourages Americans to drive, not walk. In comparison, 25% of Dutch commuters bike, compared to less than 1% of Americans who commute to work via a bicycle. When examining cycle tracks vs. cyclists riding next to motorists on roadways, the study found much lower risks on bike tracks. In fact, when given the choice, the study found that cyclists were 2 and a half times more likely to ride on congested bike paths than to choose a route that put them on the streets riding next to passenger vehicles. 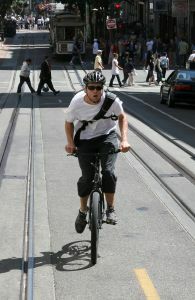 The statistics indicate men have a much higher risk for being involved in a bicycling accident. That is mostly due to the fact that women fear cycling next to motorists on roadways. The study indicated more women would be interested in cycling, but only if separate tracks were to be implemented. Americans are constantly trying to find ways to manage weight and stay fit. A healthy heart means a longer life, but is that really the case? Cycling is an excellent way to maintain a healthy heart but doesn’t necessarily mean a longer life when faced with the dangers of riding along next to motor vehicles. The Law Offices of Jeffrey S. Glassman defend rigorously for victims of personal injury accidents in Boston and the surrounding areas. If you have been in a car or bicycle accident, call 1-877-617-5333 for a free case evaluation to discuss your rights.